IDF fires back after shot at by Syrian army. Clash follows mortar shell that hit outskirts of Druze town Majdal Shams. The Syrian war continues to spill over into Israel: IDF forces on the Golan Heights near the Syria border were shot at from a Syrian army outpost Monday. The IDF returned fire and identified a direct hit on a Syrian soldier. No IDF soldiers were injured. The clash followed a mortar shell fired into Israel from Syria earlier Monday. The shell landed 50 meters (160 feet) from a house in the Israeli Druze town of Majdal Shams in the Golan Heights and caused no injuries or damage, reports AFP. According to a spokeswoman the IDF was looking into the incident. Majdal Shams is one of several Druze towns in the Golan that are still largely loyal to Syria, despite the fact that Israel liberated the area in the 1967 Six Day War. 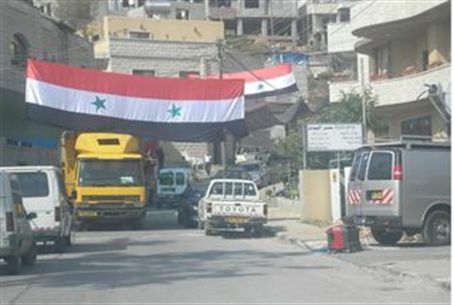 In the past, Druze residents of the town have spied on the IDF for Syria, while others have entered Syria to fight for President Bashar Assad's regime. Other Druze serve loyally in the IDF, usually in combat roles, including the Golani Brigade's next commander. In September, following "heavy clashes" in the Golan in which Israel was shelled, UN envoy to the Middle East Robert Serry warned that fighting in the area could draw Israel into the Syrian war, breaking the ceasefire between the nations in place since 1974. The same month Syrian Foreign Minister Walid al-Muallem spoke at the UN General Assembly, saying his country "intends to reclaim the Golan." Foreign Minister Avigdor Liberman (Yisrael-Beytenu) in October emphasized that as long as he was in the government Israel would not concede any part of the Golan Heights to Syria. The Syrian war, now in its third year, has left at least 120,000 dead and created 2.2 million refugees according to UN estimates.